Wedding Tutus - Why walk down the aisle when they can Pirouette? Why walk down the aisle when they can Pirouette? These truly are the prettiest flower girl dresses I have seen in a long time…absolutely perfect for a beach wedding abroad! Destination weddings are hot!! 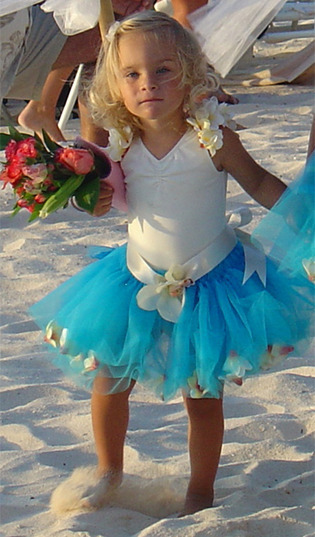 Check out the latest in flower girl trends for your island wedding….recently spotted in celebrity beach weddings, tutu’s hottest little number the “keiki lei tutu”, for those special beach celebrations and island-style ceremonies. This new design boasts the same full and fluffy tulle skirt with beautiful tropical orchids and plumeria trim….a must-have for any destination beach wedding flower girl (shoes optional). Other new designs include the “l’autumn tutu adorned with real preserved maple leaves, and l’etoile tutu for your little shining star, and several other holiday styles. These flower girl dresses and wedding tutus are perfect for destination weddings More and more couples are planning their wedding celebrations away from their home towns for a stress free, beautiful and adventurous wedding! Let the beautiful ocean front sunset beaches, palm trees, and crystal clear waters provide the setting for your beautiful wedding – guaranteed stunning photographs and many a happy wedding guests! They are nothing short of irresistible…little girls will LOVE them! Click here to see the full range.